I always find it so hard not to get involved when the kids are making (and making a mess). This looks like they had great fun! This looks so much fun. I love the look of dyed rice, it's so beautiful, I must try making some. Awww, that looks great. 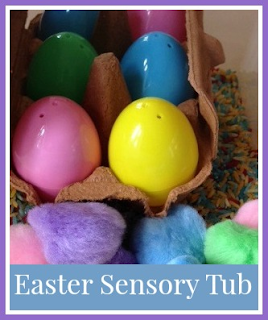 I always love a good sensory tub. Oh that's fun. I need to sweep up our sensory bin this evening. There are chicks and lentils all over the floor. It's the only problem with them. Such a lovely idea! And they certainly look like they're having fun with it! That looks like great fun :) I've never done a sensory box, must pull my finger out!!! I love sensory boxes .